In the past few days I've been exploring the Satin stitch with a (still) small Satin Stitch Doodling project. 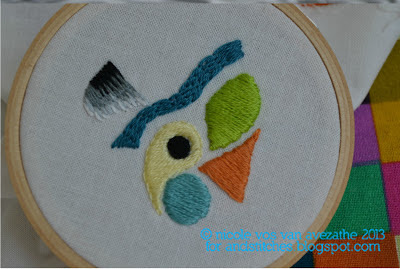 I love the look of the Satin Stitch but find it's hard to get a great result every time. I also wanted to try out some variations with the Satin Stitch I had not tried before. I stopped using water erasable pens for my regular Embroidery projects (as I suspect it can sometimes leave stains on your fabric) but for this Doodling project the blue pen is my friend. I just draw shapes directly on the fabric as I doodle along. I grabbed some floss to start with (and added more colours later) and started with a simple circle (1) . With Julie's tips in mind about outlining with a split stitch and how to prevent 'egg' shaped circles, I started filling from the middle of the circle with two strands of floss. I'm normally a one strand of floss kind of person but found that I could achieve a rather smooth result with two strands as well. I then added a 'waterdrop' shape (2) with my blue pen which I outlined with a split stitch and filled in with a diagonal Satin Stitch. 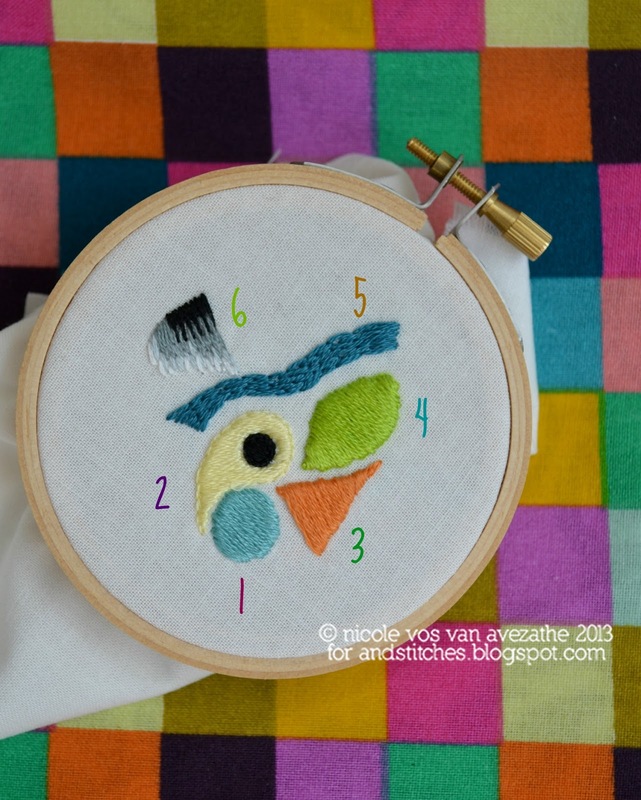 I drew a few extra guidelines as I always have trouble keeping my Satin Stitches parallel. The other problem I encountered was keeping the sides even, that's something I definitely need to practice more! Adding a backstitch all around the shape fixed that somewhat but I'd rather have a Satin Stitch without an outline... The small black circle was added 'freehand' and it showed so I added an extra outline as well. Luckily stitching with black floss is quite forgiving and an extra stitch here or there doesn't really stand out. :) The orange triangle shape (3) was meant to practice keeping the sides even. Still not entirely successful with that, I'm afraid. The Padded Satin Stitch (4) was a new stitch to me. I chose to outline and filled the shape with the chain stitch (see photo, before filling obviously) and then covered those with the Satin Stitch. Again the sides ended up quite uneven and I was slightly disappointed by the 'height' of the padding. 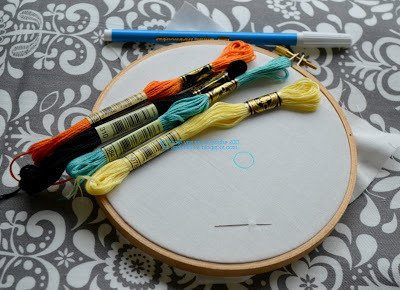 A tutorial for the Padded Satin Stitch will be up on this blog later this month and I'm looking forward to Carina's tips! The length of the Satin Stitch at it's widest point (in the middle) was just about what I felt comfortable with when making Satin Stitches. When your stitches are too long they will not lie flat on the surface and as a result your stitching will not look as smooth as you probably like. There is also a bigger chance that when stitching your needle catches a too long Satin Stitch and it will pucker. I'm quite pleased with the overall look but I can definitely use more practice with the Satin Stitch. Hope you enjoyed my explorations of the Satin Stitch! 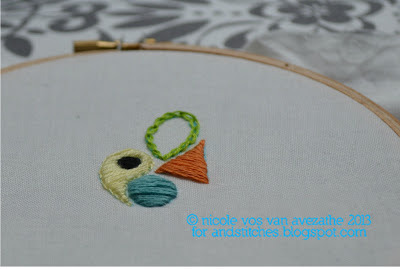 Later this month I'll be back with some Satin Stitch variations. 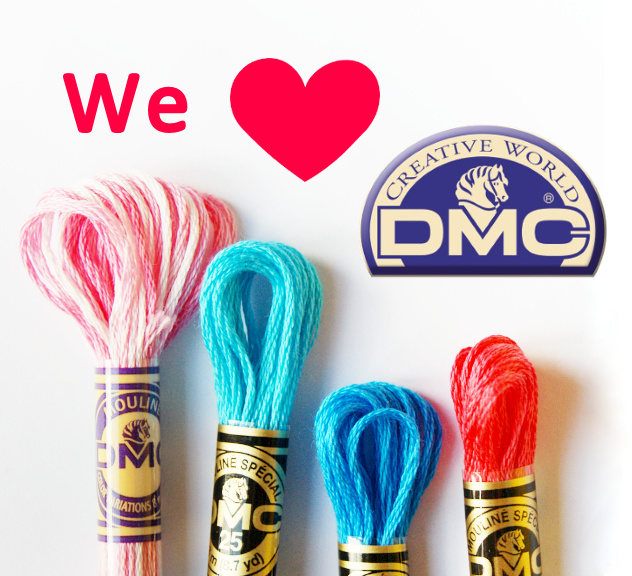 If you decide to start your own Satin Stitch Doodling (or any other kind of Doodling really) please share it with us in our Flickr group. Nice post- i'm glad to see that someone else has encountered all of the same issues I have with satin stitch! It's such an elegant stitch that any minor slip-ups become glaringly obvious. Just need to keep practising I suppose! Looks a bit like a parrots head.